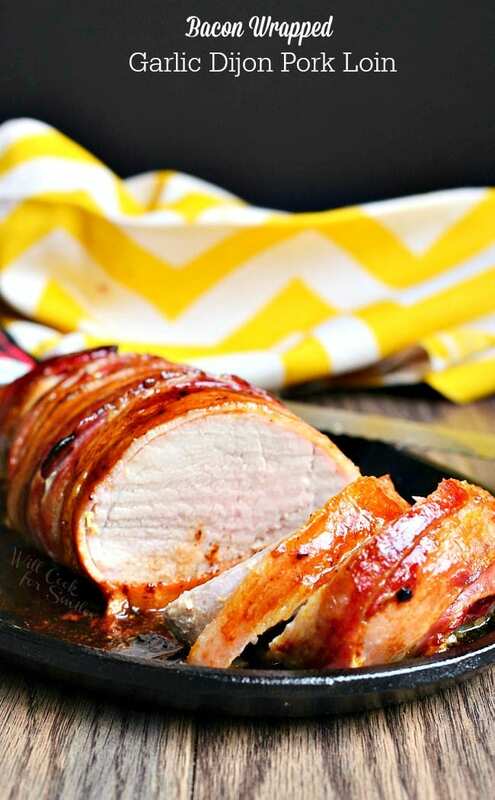 Bacon Wrapped Pork Tenderloin is a delicious main dish for a weekend dinner. 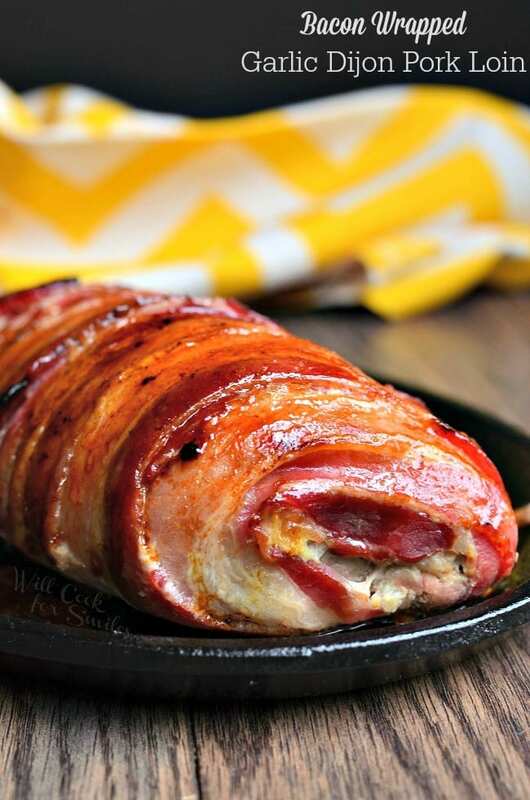 Unbelievably delicious pork tenderloin smothered in Dijon mustard and fresh garlic, wrapped in bacon, drizzled with a bit of honey and roasted to perfection. 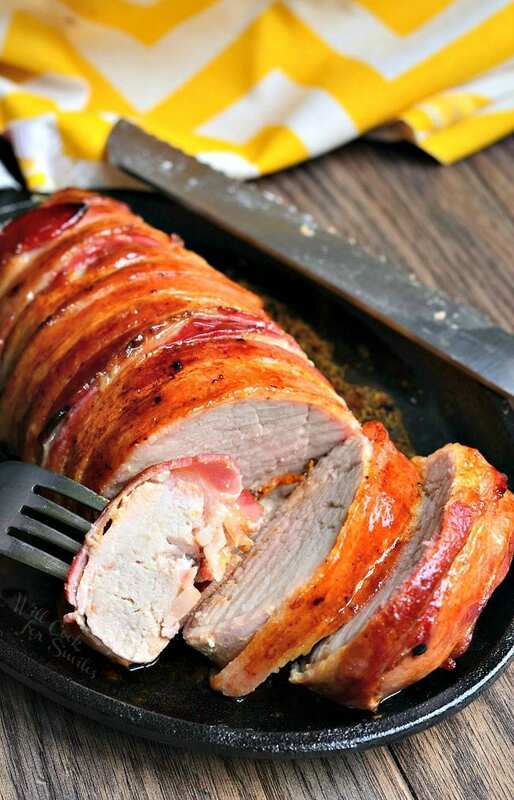 Pork tenderloin is the long, thin cut of pork that runs along the spine from hip to shoulder. It is the softer, juicier, and more tender cut of meat. Personally, I think it is the best cut of pork. Pork tenderloin is very easy to cook in the oven or even on stove top. It can be roasted in the oven whole or cut into slices and cooked in a cooking pan on the stove. Pork cooks quickly so be careful not to overcook it. If you’re planning on making something other than turkey for the holidays, I highly recommend pork. 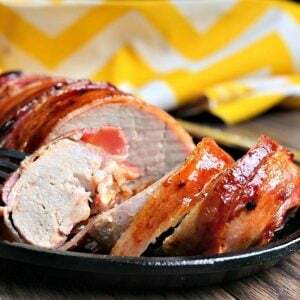 This Bacon Wrapped Pork Tenderloin is amazing and would make a wonderful holiday dinner addition. Actually, it would be perfect for any weekend dinner. So simple and tasted incredible. I’m not lying about how simple it is. It all comes down to rubbing pork with some Dijon mustard and garlic and wrapping it in bacon. Then, just place it in the roasting pan and drizzle with some honey. That’s it! Easy-peasy-delicious. How to reheat pork tenderloin? If you will have leftovers, best way to reheat this pork is in a saute pan over medium heat just until heated through. Pork tenderloin is a tender meat and it will stay tender while reheating. Dijon mustard will caramelize nicely, adding some great flavors. I enjoyed this pork even more the next day. 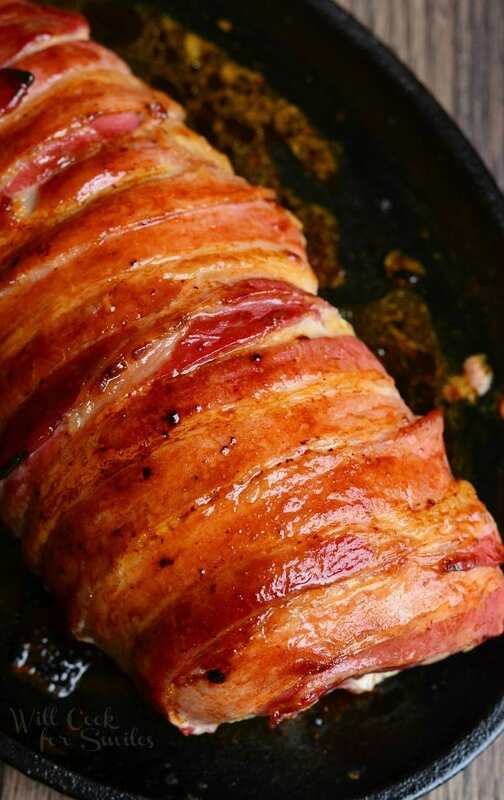 Unbelievably delicious pork tenderloin smothered in Dijon mustard and fresh garlic, wrapped in bacon, drizzled with a bit of honey and roasted to perfection. Press garlic (or grate) and mix it with Dijon mustard. Rub mustard/garlic mixture all over pork tenderloin, evenly. Salt it to taste. Wrap pork in bacon, overlapping bacon strips slightly. 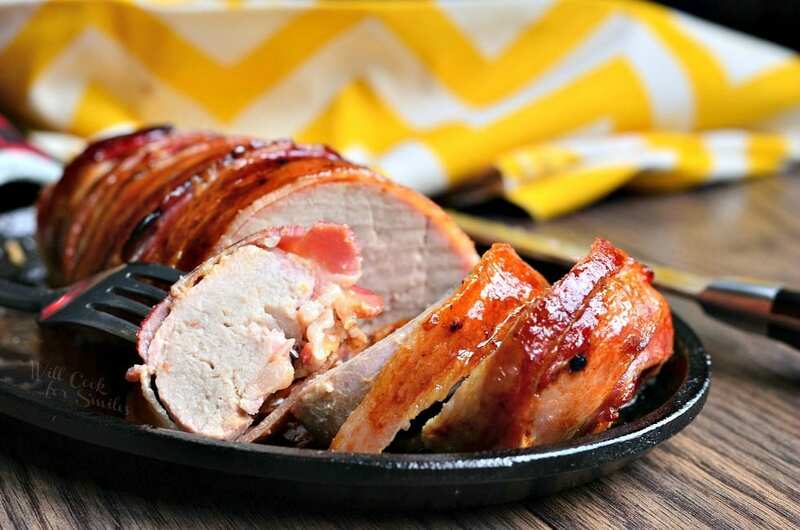 Carefully place pork tenderloin in a roasting pan and tuck in any loose bacon ends if needed. *Cook time will depend on size and thickness of pork. If you get a long thin cut, cook time will be shorter. If you get a thicker cut, cook time will be longer. 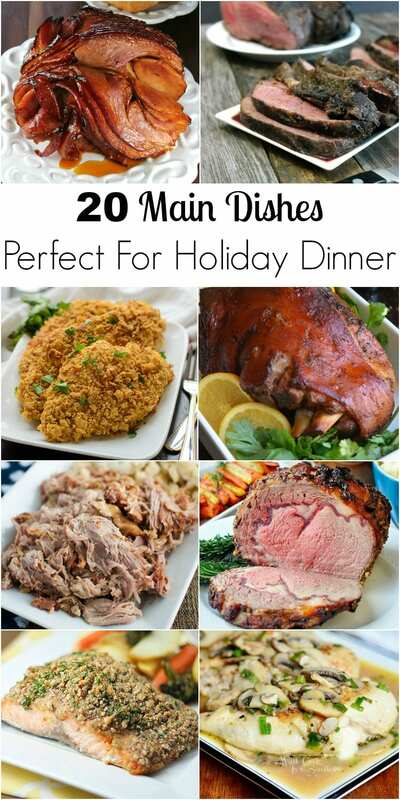 Make sure to get some more main dish ideas in this collection! You can click on the photo or HERE. Originally published on Will Cook For Smiles on May 27, 2015. OMG! This is so simple and so delicious sounding and looking. I think I will make this for Easter in place of the traditional ham. Pork! It should amaze everyone. This looks and sounds AMAZING! Definitely giving this a try, thank you!! Very simple to make but it definitely looks delicious! I will give this a try. It’s very wonderful! It really is delicious!! Thank you, Maureen! I believe it will work on both but I had a tenderloin. I’m making this for dinner tonight. I’m going to use orange blossom honey, and I’m pairing it with baby red potatoes roasted with rosemary and thyme, and a cranberry walnut spring salad. I also got a great bottle of Moscato to go with dinner. Can’t wait to enjoy this meal. Thanks for the recipe. Oh my goodness, can I come over? The whole dinner sounds fantastic! Made this last night and it was very delicious! The pork was soft and moist ,my husband and i loved it. thank you very much Lyuba! Two big smiles for you! 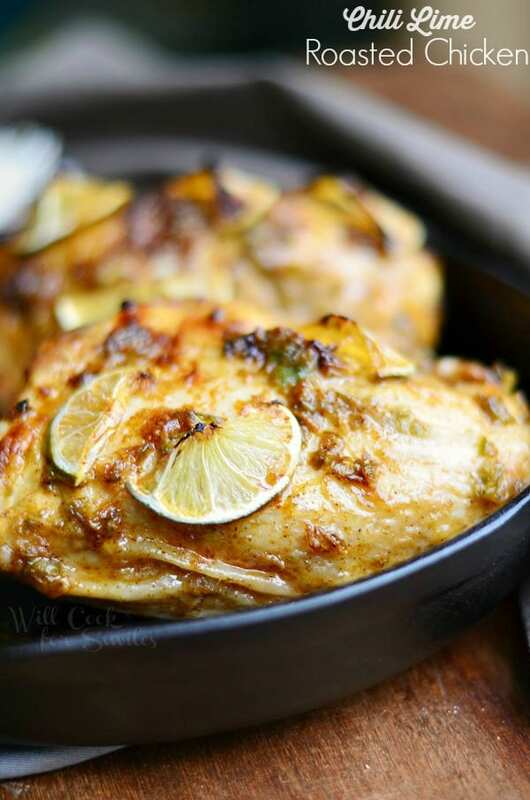 Decided to comment, because I’ve made this recipe countless times now! 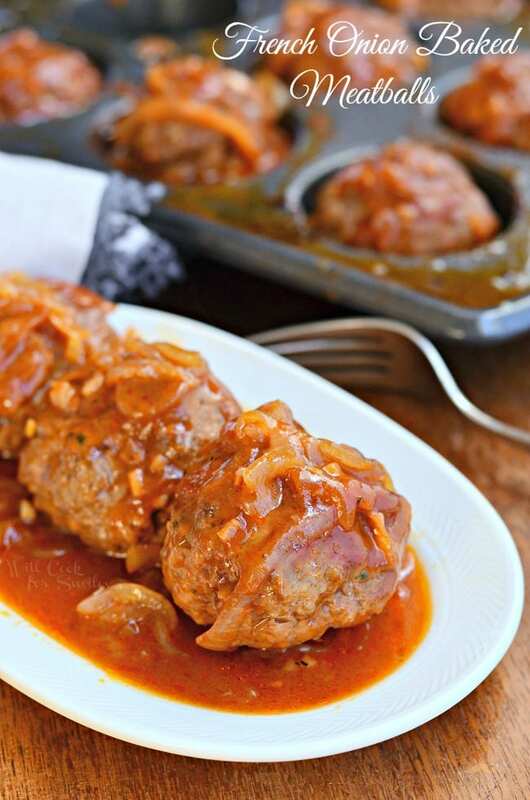 It is so easy and delicious, it’s a staple in my recipe repertoire when I need a simple, reliable meal. We love it! Can you cook this as a crockpot meal? What liquid would you suggest adding? 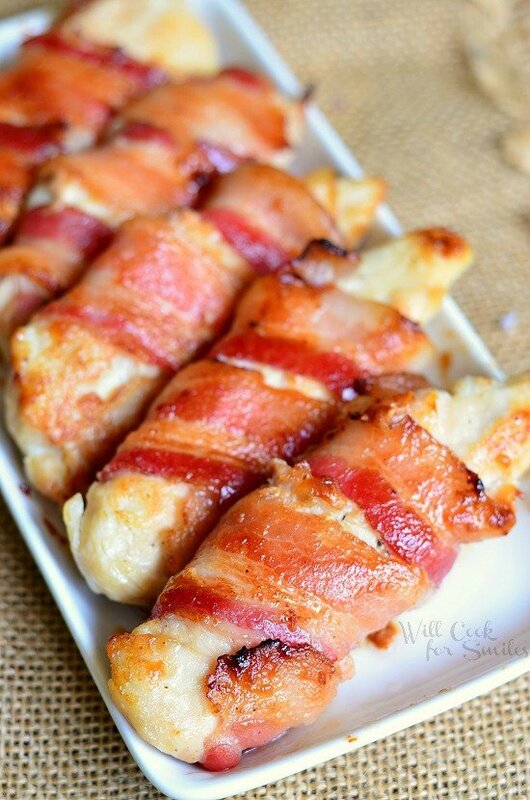 I don’t think this is going to work in a crock pot because the bacon will not crisp up but be soggy instead. Oven-roasted way is actually quite fast and juicy.